According to official estimates by government research group China Internet Network Information Center, which are released every six months, the number of Internet users grew at an average of 6.1 million users per month in 2007 and would total about 225 million now. 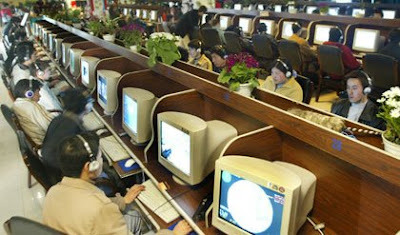 In its own research, BDA China Ltd., a Beijing-based technology consulting concern, estimates that China has as many as 228.5 million Internet users, compared with 217.1 million in the U.S.
BDA estimates revenues from China's online games sector totaled RMB 13.3 billion (USD 1.88 billion) in 2007. China's online games revenues exceed the combined revenues from its online brand advertising (RMB 6.6 billion, or USD 930 million) and search (RMB 2.8 billion, or USD 395 million), according to BDA estimates. The United States still far outstrips China in the value of internet content, advertising and e-commerce, but BDA expects e-commerce to become the next boom sector in China as businesses and retailers take advantage of the mass market of consumers already online. BDA's Clark added: “With some 560 million subscriptions, China has been home to the world's largest mobile communications user base for several years. Now it adds internet users to its gold medal collection. While the volume of communications users will continue to boom, the focus now in China will increasingly shift to deriving greater value from these consumers. So far, online advertising has yet to flourish in China, where even the largest Internet companies, including search company Baidu.com Inc., operator of the most-popular Web site in China, have said they struggle with convincing small- to medium-size advertisers of the efficacy of paid search. E-commerce, which is expected to be a major driver for online advertising, also has been slow to pick up because many consumers are unaccustomed to shopping online and are reluctant to pay for products electronically. For now, China has only about a 16% Internet penetration rate, compared with a global average of 19.1% and the U.S.'s 69.7%, according to China Internet Network Information Center. With the large population of internet users, B2B websites are becoming a trend in China. Http://www.madeinchina.com is a famous B2B website offering various kind of information on Chinese industries. I read your blog and I like your post in this blog. really cool..keep it up!I wish I can travel to china one day.This is my blog http://creditcardspartner.com, it's about secured student credit card .